Garden City, NY: Doubleday, Page & Company, 1915. Cloth. Near Fine/Very Good. A truly impressive copy of the 1915 1st edition. Tight and unusually crisp, with just a touch of light foxing to the endpapers. And in a bright, price-intact ($1.25), VG- to VG example of the 1st issue pictorial dustjacket. Light chipping at the spine crown and along the panel edges and tips, light foxing to the panels. Still though, handsome and very presentable --and notably uncommon in dustjacket. 12mo, 9 line-drawn illustrations complementing the text, co-written by the formidable Grantland Rice. 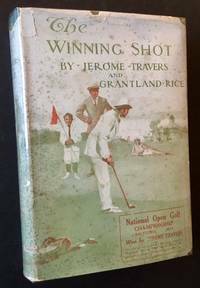 Jerome Travers had just come off a win at the 1915 US Open at Baltusrol to add to his 4 US Amateur Golf Championships and, by any measure, was (and still is) considered one of the great golfers of the early part of the 20th century. 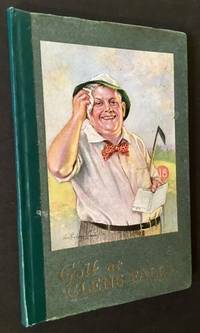 His name is included among some of the immortals of the day such as Harry Vardon, Francis Ouimet, Chich Evans and Harold Hilton. (Donovan & Murdoch 37130). New York: Nat Fleischer, 1942. Original wraps. Very Good +. 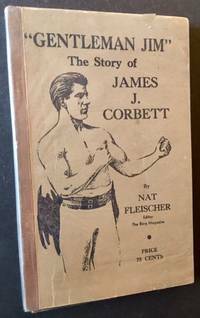 A very solid copy of the 1942 1st edition, written by Nat Fleischer, the redoubtable editor of Ring magazine. Tight and VG+ in its pictorial, light-brown wrappers. Octavo, generously illustrated thruout (with mostly etchings but with some black-and-white photos as well). New York: Sports Illustrated, 1954. Original wraps. Near Fine. 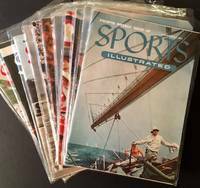 An impressive run of early issues of "Sports Illustrated", all from 1954, the magazine's maiden year of publication. 11 issues all told, all in crisp, easily VG+ to Near Fine condition. The issues are as follows: # 4 (Sept. 6, 1954); #6 (Sept. 20, 1954); #8 (Oct. 4, 1954); #9 (Oct. 11, 1954); #10 (Oct. 18, 1954); #11 (Oct. 25, 1954); #12 (Nov. 1, 1954); #13 (Nov. 8, 1954); #16 (Nov. 29, 1954); #19 (Dec 20, 1954); and #20 (Dec. 27, 1954). Washington, D.C.: Colubia Publishing Co, 1952. Cloth. Very Good +/Very Good. 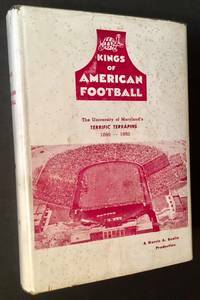 A very solid copy of the 1952 stated 1st edition. Tight and VG+ in a bright, VG example of the pictorial dustjacket, with light spotting to the panels and very light creasing --with just a touch of chipping-- at the panel edges. Thick octavo, dozens of crisp black-and-white photos thruout. Chicago: P.F. Volland & Co, 1916. Briggs. 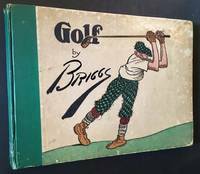 The 1916 1st edition of this wonderful collection of golf cartoons by Briggs, half of the cartoons (formatted in panels) drawn in color. Solid and VG in its pictorial boards, with light soiling along the edges and light creasing at the foot of the spine. Tiny former owner stamp at the title page, otherwise very clean internally. 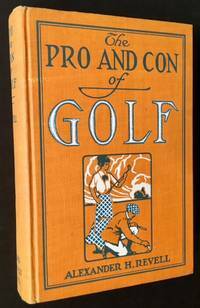 Oblong quarto, ribald, over-the-top golf humor from over a century ago. London: Collins, 1936. Cloth. Very Good -/Very Good -. J.E. Broome. 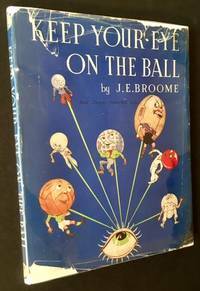 The 1936 1st edition of this humorous look at the game's light side, wonderfully illustrated thruout by J.E. Broome. Tight and VG- (offsetting to the panels, fading at the spine, very light foxing to the preliminaries) in a crisp, price-clipped, VG- dustjacket, with light chipping and creasing along the panel edges and light soiling to the rear panel. Octavo, verse and prose (almost the equal of the illustrations) by John Adrian Ross. London: Kegan, Paul, Trench, Trubner & Co, 1911. Cloth. Very Good. E.W. Mitchell. 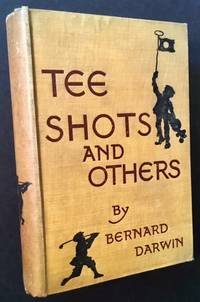 The 1911 1st edition of this very early collection (his 2nd published book) of golf-themed stories by arguably the game's premiere writer of the 20th century, Bernard Darwin (grandson of Charles Darwin). Solid and VG in its light-brown pictorial cloth, with still-bright gilt-titling along the spine. Light soiling to the panels, pronounced foxing at the endsheets, lesser foxing to the preliminaries. 12mo, nicely illustrated thruout in silhouette and etchings by E.W. Mitchell. London: Osgood, McIlvaine & Co, 1895. Decorative Cloth. Very Good +. 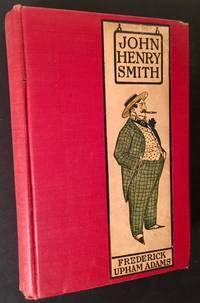 The much less common --and far more attractive-- 1895 1st British edition, following the original American edition by one year. Tight and VG+ in its duotone cloth, with crisp gilt-tiling and design along the front panel and spine. Neat former owner inscription at the front pastedown, offsetting to the front and rear endpapers. Just a touch of light staining as well at the foot of the preliminaries (not affecting the text at all). Thick octavo, generously illustrated thruout in crisp black-and-white photos and etchings. Edinburgh: David Douglas, 1895. Cloth. Very Good. 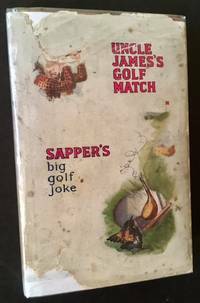 The 1895 1st edition of this collection of late 19th century golf humor-in-verse. 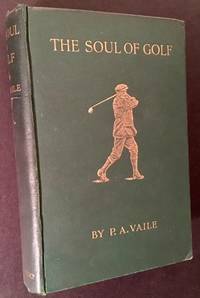 Solid and VG in its dark-green cloth, with bright gilt-titling along the front panel and spine. Light rubbing to the front panel, very light soiling at the rear panel, otherwise very clean. Thin 16mo, 68 pgs. 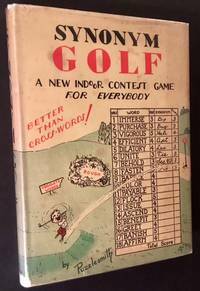 plus publisher's list of recent golf publications at the rear. London: Methuen & Co, 1932. Hardcover. Daniel Browning. The 1932 1st edition. Solid and VG+ in its green boards, with crisp gilt-titling along the spine. Thin strip of light offsetting at each of the endpapers, otherwise very clean internally. 16mo, 50 line-drawn diagrams thruout supplementing the text. London: A.&C. Black, Ltd, 1919. Cloth. Very Good +. A very solid copy of the 1919 1st edition. Tight and VG+ in its green cloth, with blindstamped titling and just a touch of light foxing to the front panel. Thin 12mo, 82 pgs. plus publsher's ads at the rear. Chicago: Rand McNally & Co, 1915. Decorative Cloth. Near Fine. A crisp, very nice copy of the 1915 1st edition. Tight and Near Fine in its wonderful pictorial cloth. Light foxing at the rear pastedown, otherwise very clean internally. Thick 12mo, 277 pgs. New York: George H. Doran, 1922. Cloth. Very Good. 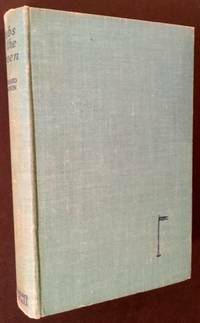 The 1922 1st American edition. Solid and VG in its green cloth, with light soiling at the front panel, very light rubbing to the rear panel and tender (but still perfectly sturdy) inner hinges. 12mo, wonderful fold-out "illustrative charts" thruout. London: Longmans, Green and Co, 1890. 1/2 leather. Very Good +. Thomas Hodge and Harry Furniss. 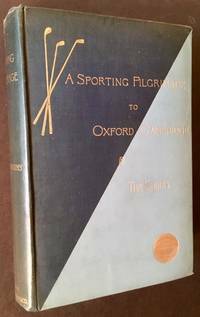 The 1890 1st edition, part of the wonderful "Badminton Library of Sports and Pastimes" by Longmans, Green and Co. of London. Solid and VG+ in its 1/2 navy-blue calf over orange cloth. Bright gilt-insignia at the front panel, bright gilt-titling to the spine. Light wear (a bit of spotting and several small scuff marks) to the panels, tasteful bookplate at the front pastedown, light foxing to the text. Thick 12mo, very nicely illustrated thruout by Thomas Hodge and Harry Furniss. 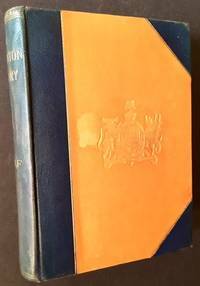 New York: Doubleday, Page & Company, 1905. Cloth. Near Fine. A.B. Frost. A very sharp copy of the 1905 1st edition. Tight and Near Fine in its wonderful pictorial cloth. Thick 12mo, illustrated thruout by the great A.B. Frost. New York: The Mohawk Press, 1931. Hardcover. Very Good +/Very Good. A crisp, solid copy of the 1931 1st edition. Tight and VG+ (just a touch of soiling at the rear panel) in a bright, price-intact ($1.00), VG dustjacket, with very light creasing along the panel edges and one small chip at the spine base. Octavo, wonderfully illustrated thruout. London: Macmillan and Co, 1912. Cloth. Very Good. 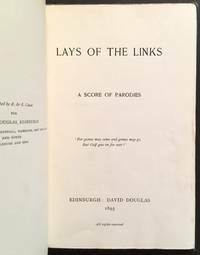 A solid, very presentable copy of the 1912 1st edition. 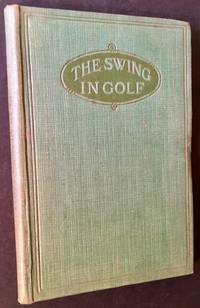 Tight and VG in its dark-green cloth, with wonderful gilt-pictorial and gilt-titling along the front panel and spine. Foxing to the preliminaries and thruout the text. Thick octavo, top-edge gilt, crisp black-and-white illustrations thruout. London: Chapman & Hall, 1936. Cloth. Very Good +. 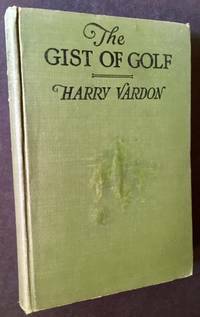 The 1936 1st edition of this collection of profiles by the great golf writer Bernard Darwin (1876-1961), grandson of Charles Darwin. Tight and VG+ in its light-blue cloth, with just a touch of mild rubbing along the spine. 12mo, 160 pgs. London: Hodder and Stoughton, 1932. Cloth. Very Good +/Very Good. The 1932 1st separate edition, having originally appeared in 1925 in Hodder & Stoughton's short story collection, "Out of the Blue". Solid and VG+ in its orange cloth. And in a crisp, VG example of the pictorial dustjacket, with light soiling to the panels and light chipping at the panel edges. 64mo (miniature), part of Hodder & Stoughton's "Little Books of Laughter" series.